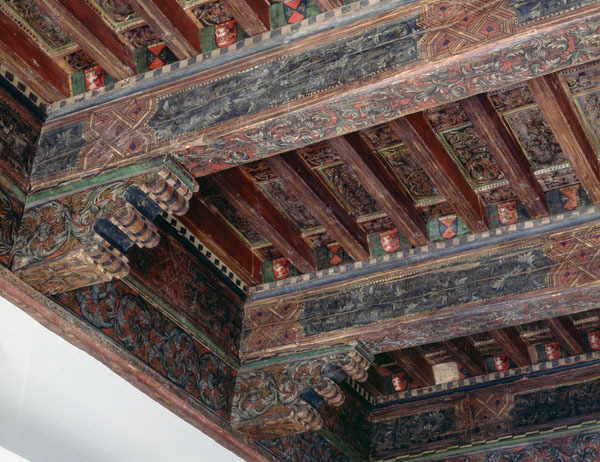 This elaborate ceiling, one of the rare examples surviving from its time, demonstrates the importance of domestic architecture at the end of the Middle Ages. By the late fifteenth century wealthy merchants as well as the landed nobility would have had the resources to commission such a room. All surfaces are richly embellished with paint, the curving leaf forms in deep greens against a warm red background. Within defined rectangles, the lush, naturalistic foliage forms rhythmic motifs similar to those found in textiles and in the decorative margins of contemporary manuscripts. The lavishness of the surface pattern lightens the visual effect of the massive structural design of the ceiling. Four master beams under narrow transverse supports ride on brackets at the juncture of the walls. 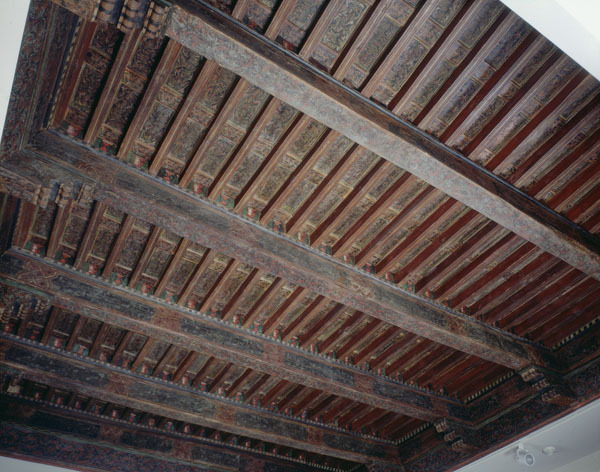 Heraldic badges, common forms of identifying family lineage, appear on end panels between the beams.